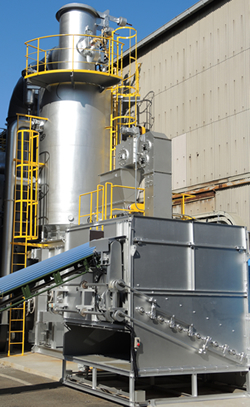 Biomass Fired Boilers｜Product Information｜Takao Iron Works Co., Ltd.
Fossil fuels such as petroleum fuel or gas are not used. ※Carbon Neutral: Because the trees capture carbon dioxide in the atmosphere during growing, even if carbon dioxide is generated by burning the trees, the amount of carbon dioxide in the atmosphere is regarded as not to increase or decrease. Usage Example:Wood Chips (construction debris, wood waste), Wood Chips (thinned wood), RPF, RDF, Chicken Droppings, Waste Mushroom Bed, etc. ※About fuels other than the above, please contact us for combustion tests. Visualization of the operating conditions using a touch panel. When an abnormality occurs, the countermeasures will be displayed on the screen. The time from startup until steam generation is short enough to eliminate early morning attendance or overtime work for operation of the boiler. By causing complete combustion of the fuel, there is no problem caused by wood vinegar and tar easily generated during the combustion of woody biomass. By controlling the combustion condition, the required quantity of fuel will be automatically supply from the fuel hopper to the boiler. When one of the sensors detects an abnormality, an alarm will be activated. When temperature, pressure and clogging sensors detect an abnormality in the fuel supply system, the operations such as the spraying of water or the closure of damper is done automatically. Also, when seismic sensor detects the earthquake motion of more than the set value, the boiler will be forced to shut down.